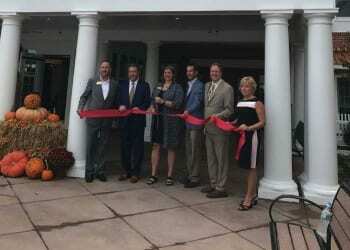 A ribbon-cutting ceremony was held on Tuesday morning for the opening of Brightview Perry Hall’s newest wing. The new, final wing at the senior living facility includes 213 units. The addition features one- and two-bedroom apartment homes as well as amenity and gathering spaces including a bistro-style dining venue with a brick pizza oven, an expanded sports pub, movie theater and game room with pool table, shuffle board, and poker table. Designed by Baltimore-based architectural team at Hord Coplan Macht, Brightview Perry Hall used nearby historic Perry Hall mansion as its design inspiration and is reminiscent of the Early Georgian architectural style of the mansion, characterized by elegant proportions and loose symmetry along the main façades, gabled dormers, one-story front porches and Greek Doric style columns. The community, located at 9657 Bel Air Road, draws people from throughout the region. One reason for its popularity is that no large entrance fees are required, unlike other retirement communities in the area. Brightview Perry Hall includes Independent Living, Assisted Living, and a Wellspring Village® neighborhood dedicated to dementia and Alzheimer’s Care.